I love the color turquoise. As a stone it is earthy and gorgeous and natural with a hippie boho vibe that is also classy and fun. In the spirit of the warm weather and long summer days filled with music and friends, I wanted to curate a treasury of trending clothes and accessories that bring out your inner gypsy. There is more than something for everyone here so have fun shopping awesome items at affordable prices. Oh, and when you order from me, I make a percentage of the sales. Click the pics below to learn more about each item. fancy at dapperhouse, Shopping, Style and Beauty, Summer. permalink. Turquoise is one of my favorite colors! I’m loving the leather sandals. Heck, I like everything featured here. the Pom Pom bracelets are amazing! Turquoise has always been one of my fave colors and accessories. It compliments almost any color and can be dressed up or casual. Love these looks you’ve highlighted especially the turquoise trimmed sandals. I love turquoise. Most of my house is decorated with it. I’m loving that Tree of life necklace. There are so many things in this page that I wish I had. Turquoise is one of my favorite colors in jewelry. I think if I have to pick just one thing it would be the bracelet and ring. I would love that. Turquoise is one of my favorite colors! It goes really well with my complexion and hair color so I have a lot of it. I love the products you shared too! The sandals are great! 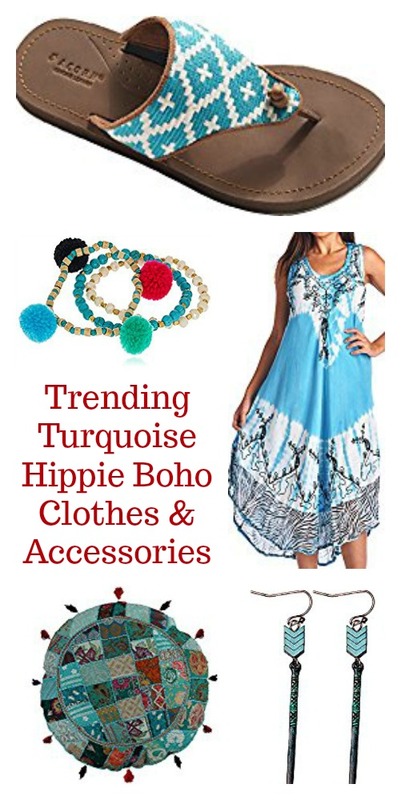 I love the hippy boho look and turquoise is such a gorgeous colour, I would totally wear so much of in this post but especially the cuff ring and skirt with sheer hem. Great picks. Love all the Turquoise. Really like the earrings with the tassels! I have always loved the look of turquoise jewelry. I have a bracelet with a big turquoise stone and it’s my favorite one ever! I kind of love that Tree of Life necklace! It is kind of fun and boho without being too much for me! The spaghetti strap maxi dress looks really stunning. The accessories here can really help mix up your outfits. Right out of my era! I am 48 so I lived through the 70’s and glad to see the Boho phase! I love all of your selections but I MUST have the Tie Dye & Embroidery Dress with Chiffon Bottom!!! Love this! I really like the bracelet with the ring attached as well as the maxi dress. Totally into the Boho look. Turquoise is my favorite color and I love boho clothes and accessories. You have a great selection here. I want to get a few of these! These are all pretty products I am having a hard time choosing! My top favorites are the Tie-dyed sling bag, the leather sandals with woven top and the Tie Dye & Embroidery Dress with Chiffon Bottom. I am bookmarking this page to check out all the items later! I love turquoise! It’s an absolutely gorgeous color and although I don’t use many accessories, it was nice looking at these. So many cool boho clothes. I’m totally crushing over that tie dye & embroidery dress. Can’t believe summer is quickly coming to an end.